Smoking and vaping in Britain? Show me the data! 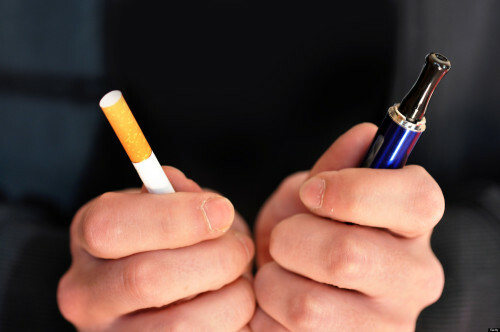 A SlideShare pack is here: Do e-cigarettes help smokers kick the habit? I’ve looked into it so you don’t have to…. here are some statistical nuggets from the 2015 data on e-cigarettes. 2.20 million people are using e-cigarettes – almost all are smokers (1.30m or 59%) or ex-smokers (849k – 39%) – with a few never-smokers (56k – 2.5%). 59% all persons ≥16 believe that e-cigarettes have no health impact on non-users, 37% believe a damaging impact. Many other figures and breakdowns in the data sources listed above. This is all mostly pretty good news. In particular, 850k ex-smokers are currently using e-cigs and a further 720k ex-smokers used e-cigs in the past but no longer. This is a substantial proportion of the smoking population over the period in which e-cigs have been rising. Note that we cannot say they are ex-smokers because they used e-cigarettes. The important thing is that they are ex-smokers. It may also be that e-cig use is valuable in preventing relapse. What’s the bad news? I think the main reason for concern is the persistent misperception of vaping risk – most people think it is much more dangerous than is plausible based on what we know of the chemistry and physics of e-liquid vapour and cigarette smoke. Less than one-third of those in the most at-risk category (smokers / ex-smokers who have not tried e-cigs) have a realistic perception of the risk of e-cigarettes (i.e. ‘much less harmful’ than cigarettes) and even among users less than half have realistic perceptions (and are likely to be more at risk of relapse as a result – if you are struggling to make vaping work, why would you bother if you don’t think the risk is that much lower? 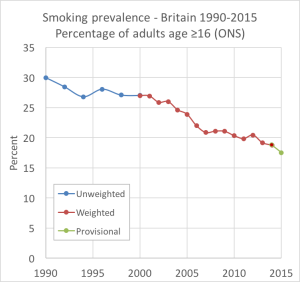 I guess we can thank the wildly irresponsible statements from public health academic and commentators and extensive slovenly journalism for this unhappy state of affairs – and the resultant protection of the cigarette trade from the competitive threat of superior new consumer technology. What’s going on with smoking? 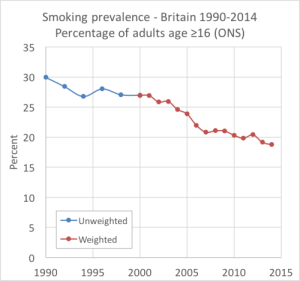 Note, the 2015 e-cigarette survey shows smoking prevalence continuing to fall – to 17.5%. This is from a different dataset to the one plotted above, so I haven’t added it to this chart. But this is how it would look. Watch Hazel Cheeseman of ASH (London) and Professor Peter Hajek of Queen Mary College discuss the results and the issues raised in the debate – this is very good. Note to American, Canadian, Australian and WHO tobacco control activists: this is what honest discussion of e-cigarettes sounds like. 21 comments to Smoking and vaping in Britain? Show me the data! Thanks for finally writing about > Smoking and vaping in Britain? Show me the data! « The counterfactual < Loved it! No doubt that these figures are impressive and a sign of success. I was just wondering about the trend. The ASH figures have been quickly and steadily rising (single users 300k in 2013, 700k in 2014, 1.1m in 2015, IIRC). So seeing new numbers that are actually lower than the last ASH figures was a bit of a surprise. But it’s a different dataset from a different source, and the data it is based upon might not actually be newer than the ASH data. My post was a question, not a critique. Like all ‘snapshot’ surveys,they give a tantalising glimpse but can never tell you ‘what’s really going on’.The ex-smoking vapers combine those who switched yesterday with those who switched 8 years ago. We must also being getting close to the point where most smokers with an interest have at least tried them – only 735k ‘Never used but might use in the future’. The most interesting stat is the number of ex-smokers who ‘Used in the past but no longer use’ of 717k.I/we usually look at the number of ex-smokers who are still vaping to estimate how many use ecigs to stop smoking. The problem is we don’t know whether this 717k comprises mainly those who used an ecig to stop smoking,then went on to stop vaping or who were ex-smokers before using ecigs.This would then raise the question of why they started using ecigs-purely for ‘fun’ or as an alternative to relapse(or something in between). It does make a significant difference to the debate about the effectiveness of ecigs as to whether the ‘quits’ are just the current ex-smoking vapers – 849k – or include all/most of the 717k as well. The figure that has been circulating last year was 2.6m current vapers, 1.1m single-users. These were ASH figures from March 2015 (as far as I understand). This report says 2.2m current vapers, 850k single-users. Was this survey later or earlier than ASH’s? Are there differences in methodology that could explain the discrepancy? If 97% of vapers in UK are smokers or exsmokers, and if 59% of UK vapers still smoke cigarettes, then 38% of vapers in the UK have quit smoking by switching to vaping, which is the most important finding (that was never cited in any of the newly released documents). I don’t understand why this finding was never cited, while many irrelevant factoids were highlighted in the documents. We have a large and expensive Stop Smoking Service comprising specialist full-time advisors plus part-time advisors in GP surgeries and pharmacies(both prescribe NRT or Champix/Chantix).According to the most recent study(2013)the 1 year quit rate for the specialists is ~10% and for the part-timers about 5%. OTC ecig quit rate has been assessed by the academics as the same as the part-timers,in my view to protect the supremacy and funding of the specialists.In reality,the success rate of ecigs is much higher than the specialists but,obviously,this is not in line with TC strategy so we get a constant massaging upwards of the SSS rates and a belittling/avoiding of the ecig rate.C’est la vie!